Worldwide leader in product identification & traceability technology. Laser Marking Systems - Diode-pumped, Fiber, Green and CO2 marking lasers and laser integration systems for direct part marking applications. 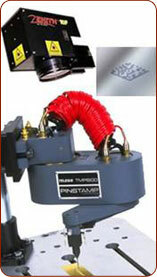 Pinstamp Marking - Programmable, permanent marking systems for part identification traceability. Large family of bench type or handheld machines capable of marking text, arc text, logos, 2D codes and OCR fonts. Machine Vision and Industrial Barcode Readers to improve quality, lower manufacturing cost and eliminate production errors. 1D and 2D Data Matrix Bar Code Readers. An industry-leader in automated parts feeding systems. A supplier of Storage Hopper Units or Bulk Storage Devices. Vibratory Inline Feeder Units, Vibratory Bowl Feeder Units, various types of Escapement Devices (Blow Feeds, Cross Shuttles, Pick and Places), Rotary (Centrifugal) Feeder Bowls & the recently established Step Feeder product line. 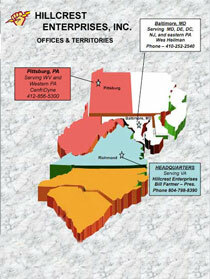 Experts in Electronic Data Collection, Data Analysis, Custom Programming and Systems Integration. Programmable equipment for traffic management systems. ability to assess the application needs of its customers and provide innovative solutions. enables the adaptation of Welker components to a wide range of applications. Sign up for our e-Newsletters today! Have questions? Need assistance? Submit your question to us on-line...click here. Hillcrest Enterprises Inc. © 2019, All Rights Reserved. Web site design and hosting provided by Global Web Solutions Inc.